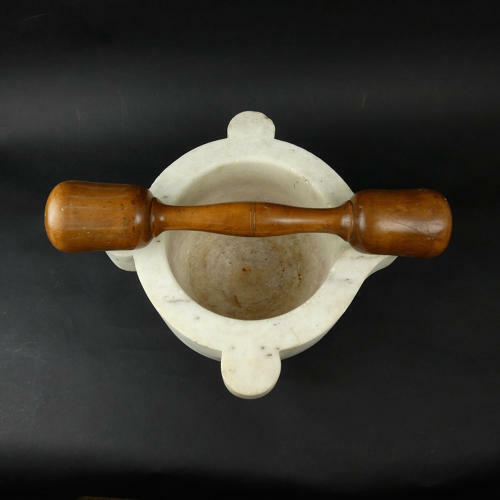 An early 19th century, white marble mortar with a double ended boxwood pestle. This is a good, usable size, and would be a very attractive addition to a kitchen. The white marble mortar has a grey fleck. It is 19.5cm. high by 33cm. across and, other than a couple of very small chips to the rim, is in very good condition. The Boxwood pestle is 39.5 cm. long. The wood has a beautiful, rich patina and it is in excellent condition. This dates from c.1820. Price includes postage within the U.K. Shipping to the U.S.A. add £70. Western Europe add £30.